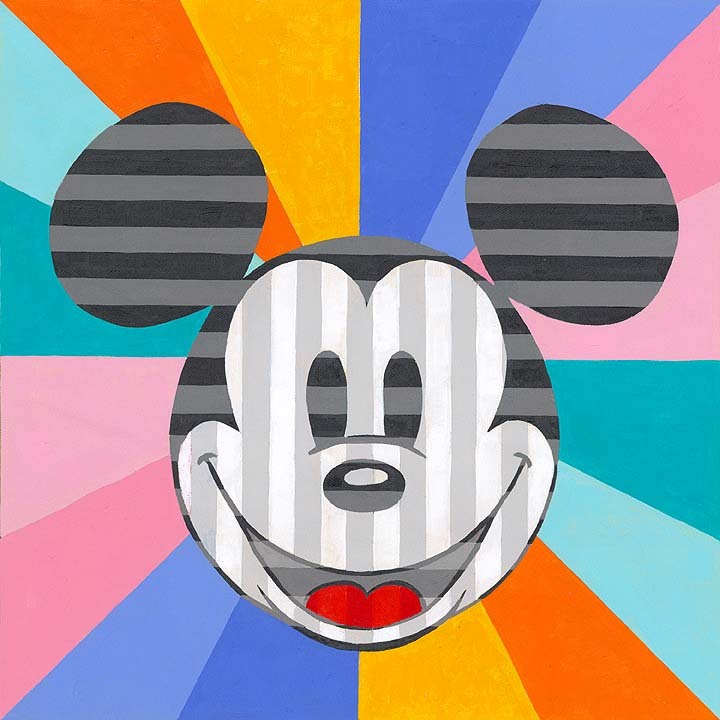 “Mickey Emits Rainbow Burst” was the first piece that I did for the collection. The idea that was in my head at the time was that I was only allowed to do one to two pieces, and these (one to) two really had to count if I wanted to represent my style among the collective of other Disney Fine Artists who also were in the project. Previously with my work with DFA, I relied on geometric set ups to place my color choices. Everything is laid out to plan, kind of like a color by numbers grid, so that each pigment has a place. This is how colorblind people operate. If we cannot see the color, then we have to learn what color is by codes and words, and those codes and words are placed into purposely segmented areas to achieve a harmonious end result. In essence, the real art in a sense, is the communication from two different seeing color worlds (you from the world of color, and us from the world of codes and words). Disney Fine Art retitled this “Mickey Emits Rainbows of Happiness” I believe.